Yapsie.com is a centralized resource for all things pet-related. A personal project started with a couple of friends, Yapsie's goal was to create a site where pet owners could go to find everything from a well-recommended vet, to a pet-friendly apartment, to local pet-related events. Focused on San Diego and San Francisco, Yapsie has hosted several successful pet events and aims to be the go-to source for hosting or attending local events. On the site, you can create a profile for all your pets, network with other pet owners, and get or share advice in the forums. 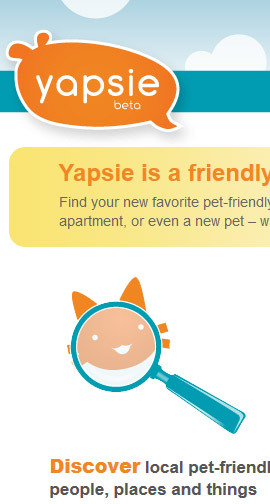 As they say on the site, Yapsie is a friendly place for pets and their people. I also created several social aspects to the site, such as friending, adding pets, setting up profiles, searching business, writing reviews and rating, browsing for pet-friendly services, the ability to view other registered users in your neighborhood, the ability to upload and comment on photos, and a mail system for communicating among users. Used Facebook API to integrate with users' walls and the activities they posted about on the site.